A critique of the black bloc, which the author sees as coming from a specific context, time and struggle. Now, stripped of these things, it has become both a tactic and identity with an implicit strategy of grabbing attention or creating autonomous space through street fighting and property destruction. The revolutions of the twentieth century were sparked by the challenge of syndicalism, which advanced the idea of self-management in workers’ councils – in Russia called soviets. 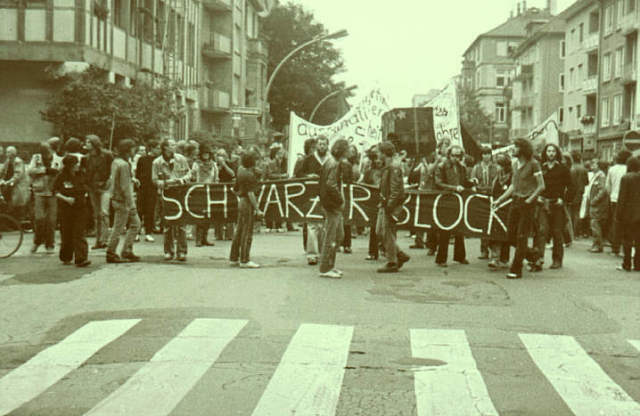 Paolo Virno, who participated in Autonomia, has tried to theorize the general logic of the soviet form, no doubt strongly inspired by the social centers of his own time. Virno describes soviets as “the organs of nonrepresentative democracy,” the space in which the cooperation and creativity that capital increasingly relies upon for production can take on an independent public existence. Their goal is to “emancipate virtuosic cooperation from its present connection with waged labor.” In this regard the social centers are recasted as historical attempts to reanimate the soviet form for a context marked by “post-Fordism,” and the visible importance of knowledge and communication in the rapidly expanding service sector. Salar Mohandesi is a graduate student at UPenn and an editor of Viewpoint. Great article. I think that the "compulsion to repeat" the tactic of street fighting is also the result of trauma from repeated violent encounters with police. I think that people may be trying to provoke a violent police response, not only to "spectacularize" the movement (though that is definitely a part of it) and compensate for the lack of militant strategy, but also to relive the trauma of being beaten and gassed, as if to say, "see? This happened to me! This happens!" Just a thought. I think maybe there is a strategy.. and just because the author isn't aware of it, doesn't mean it doesn't exist. Oakland seems to have a very clear agenda about the right to occupy public space (remember that) and to be employing certain tactics towards that end, obviously unsuccessful at this point -- but that doesn't mean that the trategy doesn't exist in the first place. the social context is similar. house squats are getting set up left and right, just not industrial squats where its part of a city. posting of plans are on internet often, so police just happen to know about move-ins sometimes, but its not as though it is disingenuous to set up squats, and its not as if every attempt to set up squats is met with hostility. athens shows their efficacy, but they seem like proto-workers militias. I agree. I just stumbled across this article on POCO! and thought I'd see if it was on here, and what kind of discussion it may have started. My only problem with it is that the author doesn't seem to know about the Infoshop Movement as the contemporary continuation of Social Centers. I brought this up on Viewpoint Magazine and am waiting for a reply. What do you think about the Infoshop Movement as contemporary Social Centers? I think it would be interesting to compare and contrast squated SOcial Centers in the ’70s and ’80s with rented or bought Infoshops now. Great and simple analysis, theoretically and historically. Thanks! Makes me wonder if out of the occupy movement, with its recent salient focus on foreclosure eviction resistance; Take Back the Land (the NGO version of squatting) type tactics; re-occupying vacant homes, something like black bloc could again have meaning tied to a strategic orientation as well as to that theoretical piece not mentioned in this article which determines both strategies and tactics, namely political line.